What factors determine nomophobia, otherwise known as smartphone separation anxiety, and what behaviors and descriptors can help identify people with high nomophobia who tend to perceive smartphones as their extended selves? A new study that compares how people with high and low nomophobic tendencies perceive and value their smartphones is published in Cyberpsychology, Behavior, and Social Networking. 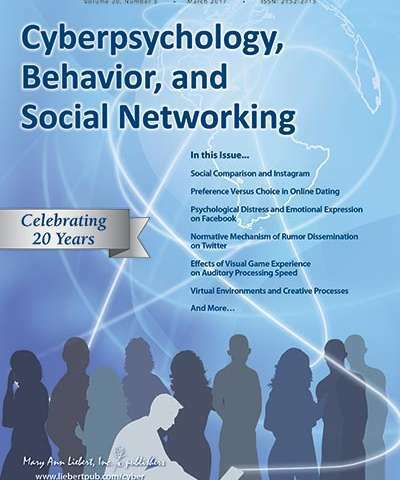 The article entitled "Understanding Nomophobia: Structural Equation Modeling and Semantic Network Analysis of Smartphone Separation Anxiety" was coauthored by Seunghee Han and Jang Hyun Kim, PhD, Sungkyunkwan University, Seoul, Republic of Korea and Ki Joon Kim, PhD, City University of Hong Kong, Kowloon. The researchers developed a model that identified a link between factors such as personal memories and user's greater attachment to their smartphones, leading to nomophobia and a tendency to phone proximity-seeking behavior. "Nomophobia, fear of missing out (FoMo), and fear of being offline (FoBo)—all anxieties born of our new high-tech lifestyles—may be treated similarly to other more traditional phobias. Exposure therapy, in this case turning off technology periodically, can teach individuals to reduce anxiety and become comfortable with periods of disconnectedness," says Editor-in-Chief Brenda K. Wiederhold, PhD, MBA, BCB, BCN, Interactive Media Institute, San Diego, California and Virtual Reality Medical Institute, Brussels, Belgium. When Facebook use becomes a problem, could social anxiety be to blame?